On my evening walk I noticed this sign. The truth is I've seen it many times before - there's a couple of seniors homes in the area so that's why it's there. But last night when I saw it, it struck me as kinda odd, lol. I mean, why am I watching them? Are they about to break out into a lively polka or something? Yep - you definitely have to watch those elderly pedestrians ... I mean you never know what they'll do! ha! 91. Sandy " From the Heart of Texas"
Mellow is happy! Happy Monday everyone! Oh, you have to be careful of us elderly ones! You just never know! Never saw a sign like this one, but it isn't a bad idea. We get pretty crazy. That is a great sign. A very thoughtful sign. I hope there's one in the Philippines as well. People here expect the elderly to be as sprightly as the youth. And it's a shame really. This is my first time to join MYM and I enjoy creating my first entry for it. I havn't played in so long! It's good to be back! Some of them really do need to be watched out for! Mine is up too! Hope you can visit. Happy Mellow Yellow Monday. I went to a local produce here in cali, and got some wonderful yellow items. What a hoot! This one kinda goes along with SLOW CHILDREN AT PLAY! Happy Mellow Yellow Monday. Some of the elderly folks I know would whack your car with their canes if you don't slow down, better watch out for them. Love the sign, happy MYM. Happy MYM to everyone! My post today is Yellow Bells tecoma stans flowers. Good choice for yellow Monday. What are you supposed to do with them when you find them? Looks cute! Mine is ready for a visit.. This is my first time, so glad to meet you all. That sign is a riot! I think I would get a laugh out of it every time I saw it on a walk. Very useful sign for our elderly individuals. we must guide them into the right direction by this useful and great signage. Kindly check out my entry here. Just posted my mellow yellow photos for this week. Kewl sign ... one I've never seen before but have in mind a few places it COULD be posted ... seriously! 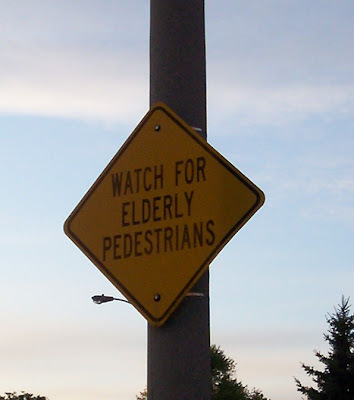 Yes, elderly people are unpredictable, especially if they are also pedestrians! And they move so quickly too! Are you sure you weren't in Florida when you took this photo LOL? :) I like that!! I have never seen a sign like that here where we live! The best place [url=http://coecomm.missouristate.edu/cs/user/Profile.aspx?UserID=2479]cheap viagra[/url] !